Like-kind exchange has been a popular tax deferral tool for decades. Under IRC 1031, a taxpayer can defer tax on gain from the sale of a business or investment property if it is exchanged for like-kind property. Real property is generally like-kind to all real property while personal property has slightly more stringent requirements. In terms of like-kind exchange, it is generally accepted that the definition of real property by state law is followed. As such, fixtures identified under cost segregation, though being depreciated under Section 1245 as personal property, are still considered real property for IRC 1031 purposes. With the implementation of new tax laws under the Tax Cuts and Jobs Act (TCJA), the definition of real vs. personal property quickly became a heated debate amongst experts. 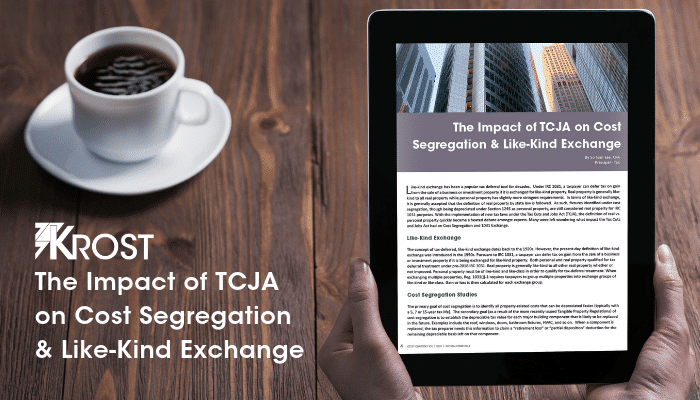 Many were left wondering what impact the Tax Cuts and Jobs Act had on Cost Segregation and 1031 Exchange. ← Is Your Firm Prepared For a Cyberattack?